Place the soy sauce, honey, ginger and lime zest in a small saucepan. Simmer gently for 1-2 minutes. Add the lime juice and tip into a bowl. Once cold, whisk in the oil. Crack open the lobsters and pull out their flesh. Slice the lobster tails into medallions. Try and extricate the claw flesh so that it holds its shape, then crack open the larger claw joints. Put the lobster in a large mixing bowl and toss in the soy dressing. Add the lettuce leaves and herbs and gently mix. 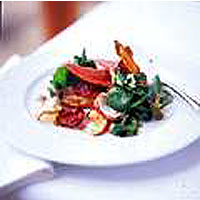 Using your fingers, fold in the crisps and carefully lift the salad on to 4 plates letting them fall in airy piles. Serve immediately.